Pope Francis repeated the theme of his just-completed to Colombia — “Let’s take the first step” — during his General Audience in St. Peter’s Square on September 13, 2017. As you know, in recent days I made an apostolic trip to Colombia. I thank the Lord with all my heart for this great gift; and I wish to reiterate my expression of gratitude to the President of the Republic, who received me with great courtesy, the Colombian bishops, who worked hard to prepare this visit, as well as the other authorities of the country, and all those who collaborated in realizing this trip. And special thanks go to the Colombian people who welcomed me with such affection and so much joy! A joyful people, with many sufferings, but joyful; a people with joy. 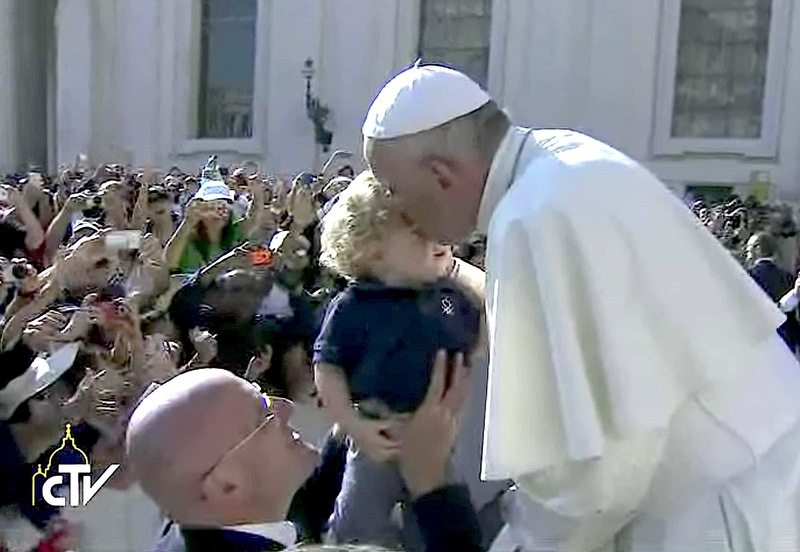 One of the things that struck me most in all the cities, among the crowds, were the fathers and mothers with children, who lifted up their children for the Pope to bless them, but also with pride, showing their children as if to say, “This is our pride! This is our hope”. I thought: a people capable of having children and of showing them off with pride, as their hope; this population has a future. And I liked this a lot. In a particular way in this trip I was aware of the continuity with the two Popes who visited Colombia before me: Blessed Paul VI in 1968, and Saint John Paul II, in 1986. A continuity strongly inspired by the Spirit, Who guides the steps of the people of God on the paths of history. The motto of the trip was “Demos el primer paso”, that is, “Let’s take the first step”, referring to the process of reconciliation that Colombia is going through as it emerges from half a century of domestic conflict, which has disseminated suffering and animosity, causing many wounds that are difficult to heal. But with God’s help the journey has now begun. With my visit I wanted to bless the effort of the people, to confirm them in faith and in hope, and to receive their witness, which is a wealth for my ministry and for all the Church. The witness of this people is a wealth for all the Church. Colombia, like the majority of Latin American countries, is a country where the Christian roots are very strong. And while this fact makes even sharper the pain that the tragedy of war has caused, at the same time it constitutes a guarantee of peace, the firm foundation for its reconstruction, the sap for its invincible hope. It is evident that the evil one has sought to divide the population to destroy the work of God, but it is equally evident that Christ’s love, His infinite mercy, is stronger than sin and death. This trip has meant bringing Christ’s blessing, the blessing of the Church for the desire for life and peace that overflows from the heart of the nation; I was able to see it in the eyes of the thousands and thousands of children, teenagers and young people who filled the square in Bogotá and whom I met everywhere; that force of life that nature itself proclaims with its exuberance and its biodiversity. Colombia is the second country in the world in terms of biodiversity. In Bogotá I was able to meet all the bishops of the country, and also the Executive Committee of the Latin American Episcopal Conference. I thank God for having been able to embrace them and give them my pastoral encouragement, for their mission in the service of the Church, sacrament of Christ our peace and our hope. The day dedicated in a special way to the theme of reconciliation, the climax of all the trip, took place at Villavicencio. In the morning there was the great Eucharistic celebration, with the beatification of the martyrs Jesús Emilio Jaramilla Monsalve, bishop and Pedro María Ramírez Ramos, priest; in the afternoon, the special Liturgy of Reconciliation, symbolically facing the Christ of Bocayá, without arms or legs, mutilated like His people. The beatification of the two martyrs reminded us in a real sense that peace is based also, and perhaps above all, on the blood of many witnesses of love, truth and justice, and also of genuine martyrs, killed for their faith, like the two I have just mentioned. Listening to their biographies moved me to tears; tears of pain and joy together. Before their relics and their faces, the holy faithful people of God strongly felt its own identity, with pain, thinking of the many, too many victims, and with joy, the mercy of God which is extended to those who fear Him (cf. Lk 1: 50). “Steadfast love and faithfulness meet / righteousness and peace kiss each other” (Psalm 85: 11), we heard at the beginning. This verse of the Psalm contains the prophecy of what happened last Friday in Colombia; the prophecy and the grace of God for that wounded population, so that it may rise again and journey towards a new life. We have seen these prophetic words full of grace, incarnate in the stories of the witnesses, who spoke on behalf of many who, starting from their wounds, with Christ’s grace came out of themselves and opened up to encounter, forgiveness, reconciliation. In Medellín, the prospect was that of the Christian life as discipleship: vocation and mission. When Christians fully commit themselves to following Jesus Christ, they truly become salt, light and leaven for the world, and we see abundant fruits. One of these fruits is the Hogares, namely the houses where children and young people whose lives have been damaged can find a new family where they are loved, welcomed, protected and accompanied. And other fruits, abundant like grapes, are the vocations to priestly and consecrated life, which I was able to bless and encourage with joy in an unforgettable meeting with consecrated people and their families. And finally, in Cartagena, the city of Saint Peter Claver, apostle of the slaves, the focus was the promotion of the human person and fundamental rights. Saint Peter Claver, like the more recent Saint Maria Bernarda Bütler, gave their lives for the poorest and marginalised, and in this way they showed the way of true revolution, the evangelical rather than ideological one, which truly frees people and societies from the slavery of yesteryear and that which unfortunately still exists today. In this sense, “taking the first step” – the motto of the trip – means drawing closer, bending down, touching the flesh of our wounded and abandoned brother. And doing so with Christ, the Lord Who became a slave for us. Thanks to Him there is hope, because He is mercy and peace. I again commend Colombia and her beloved people to the Mother, Our Lady of Chiquinquirá, whom I was able to venerate in the Cathedral of Bogotá. With Mary’s help, may every Colombian be able to take every day the first step towards their brother and sister, and in this way build together, day by day, peace in love, in justice and in truth.